PFF0645c is released from the rhoptries only after completion of merozoite invasion. (A) IEM of PFF0645c-HA merozoites pre and post-erythrocyte invasion labeled with immunogold anti-HA (white arrows). Scale bar = 0.2 mm. (B) Widefield 3D imaging of PFF0645c-HA merozoites labeled with anti-HA, anti-PfRON4 and DAPI showing early, mid and late invasion events. Scale bar = 5 mm. 3D reconstruction with 0.2 mm grid intervals. 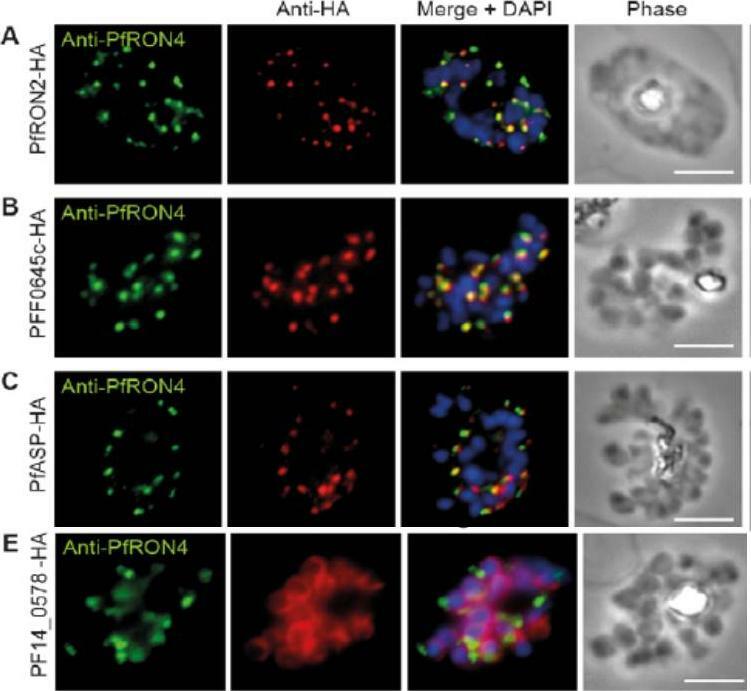 (C) Widefield 3D imaging of PFF0645c-HA early rings (,10 min post-invasion) labeled with anti-HA, anti-PfRON4 (,PVM) anti-RAP1 (PV) or anti-MSP1 (plasma membrane) and DAPI. Scale bar = 5 mm. 3D reconstruction with 0.2 mm grid intervals.Zuccala ES, Gout AM, Dekiwadia C, Marapana DS, Angrisano F, Turnbull L, Riglar DT, Rogers KL, Whitchurch CB, Ralph SA, Speed TP, Baum J. Subcompartmentalisation of Proteins in the Rhoptries Correlates with Ordered Events of Erythrocyte Invasion by the Blood Stage Malaria Parasite. PLoS One. 2012;7(9):e46160. 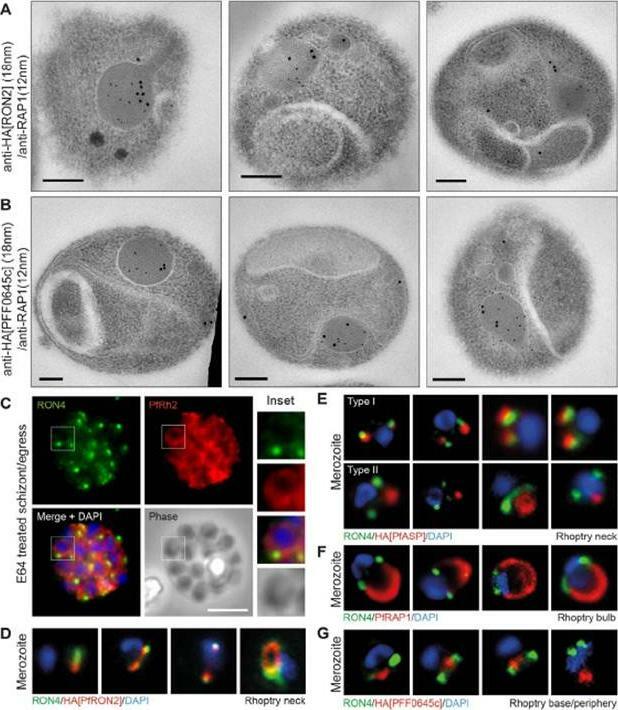 Spatial localisation of different rhoptry proteins before and during merozoite invasion. (A) IEM of free PfRON2-HA merozoites (pre-invasion) dual labeled with immunogold anti-HA (18 nm) and rhoptry bulb marker RAP1 (12 nm). Scale bar = 0.2 mm. (B) IEM of free PFF0645c-HA merozoites (pre-invasion) dual labeled with immunogold anti-HA (18 nm) and rhoptry bulb marker RAP1 (12 nm). Scale bar = 0.2 mm. (C) Widefield IFA of E64-treated schizonts (to prevent egress labeled with anti-PfRh2, anti-PfRON4 and DAPI. Scale bar = 5 mm. 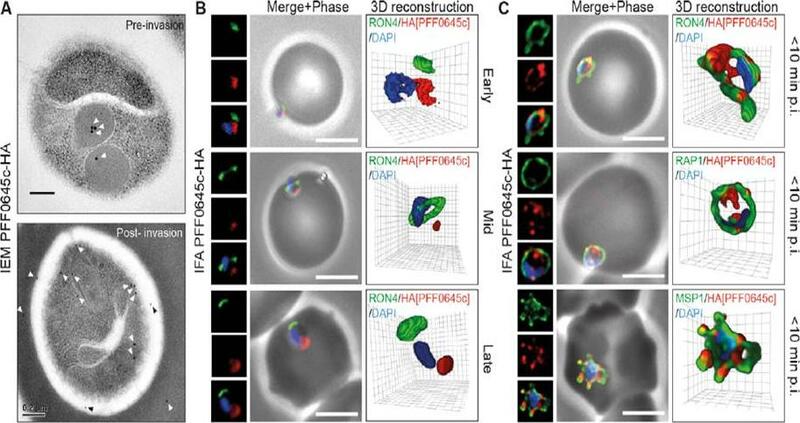 (D–G) Independent replicate imaging of merozoites from (D) PfRON2-HA, (E) PfASP-HA (two classes of distribution seen), (F) RAP1 and (G) PFF0645c-HA mid-way through invasion colabeled with anti-PfRON4 and DAPI. RON2-HA is located anterior to the bulb marker RAP1. PFF0645c had a more posterior or contiguous localisation to RAP1, frequently located towards the peripheral regions of the rhoptry.Zuccala ES, Gout AM, Dekiwadia C, Marapana DS, Angrisano F, Turnbull L, Riglar DT, Rogers KL, Whitchurch CB, Ralph SA, Speed TP, Baum J. Subcompartmentalisation of Proteins in the Rhoptries Correlates with Ordered Events of Erythrocyte Invasion by the Blood Stage Malaria Parasite. PLoS One. 2012;7(9):e46160. Cellular localisation of invasins in P. falciparum schizonts. (A–E) IFA of schizonts from HA tagged P. falciparum parasite lines labeled with anti-PfRON4, to mark the rhoptry neck, DAPI, to mark nuclei and anti-HA. (A) PfRON2 (B) rhoptry protein PFF0645c (C) apical sushi protein PfASP and (E) inner membrane complex protein PF14_0578. PfRON2-HA schizonts were colabeled with anti-PfRON4, a marker of the rhoptry neck. PFF0645c and PfASP each displayed a similar apical localization in schizonts, showing overlap of labeling with PfRON4. PF14_0578-HA labeling was peripheral in late stage schizonts (E), suggestive of an inner-membrane complex (IMC) or plasma membrane localization.Zuccala ES, Gout AM, Dekiwadia C, Marapana DS, Angrisano F, Turnbull L, Riglar DT, Rogers KL, Whitchurch CB, Ralph SA, Speed TP, Baum J. Subcompartmentalisation of Proteins in the Rhoptries Correlates with Ordered Events of Erythrocyte Invasion by the Blood Stage Malaria Parasite. PLoS One. 2012;7(9):e46160.